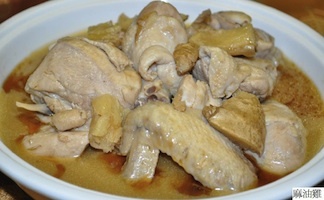 This tender bone-in chicken dish, stewed in a pungent mixture of wine and black sesame oil, pays homage to one of the dishes commonly prepared for new mothers in Taiwan. It was once the custom for mothers to eat stewed chicken with sesame oil everyday for the first month after giving birth to a child. These days, many families still follow the tradition and serve this dish to new mothers, although perhaps not every day. Heat ¼ cup of black sesame oil under medium temperature in a pot or wok. Add ginger and sauté until the ginger turns dry and fragrant. Add chicken pieces to the pot and cook until the meat turn pale, then add wine, water and sugar. Cook and bring to a boil, then reduce heat to low and cook for 40 minutes. Finally, add a single tablespoon of black sesame oil before serving. You may serve this with thin noodles. Add more water and rice wine to increase the quantity of soup. Salt is not needed for this recipe and is in fact not recommended, adding salt may result in a bitter taste. If you really must add salt, add it at the end of cooking. Some people may prefer to use wine only instead of a mixture of wine and water for cooking. An all-wine approach yields a delicious, strong-flavored result, but the alcohol may render the dish unsuitable for children to consume.